The Jerusalem population has a high proportion of children. Our young patients are treated at both the child-friendly Charlotte R. Bloomberg Mother & Child Center at Hadassah Hospital at Ein Kerem, and at Hadassah Hospital Mount Scopus. Two Pediatric departments at Hadassah Mount Scopus need upgrading. Located in East Jerusalem where Palestinian and Jewish neighborhoods converge, the Hadassah University Hospital at Mount Scopus has become attuned to providing excellent medical care in an environment that is particularly welcoming to the ethnic and cultural diversity of its patients. Hadassah Mount Scopus offers a wide range of specialized facilities and services for children from all the multicultural populations of the region. Some of these services are unique in Israel or in Jerusalem, and are recognized as national centers of excellence. With the constant population increase and advances in medicine, the number of pediatric ER visits to Hadassah Mount Scopus continues to increase. Hadassah believes that children are not simply small adults; that they must be treated in an atmosphere designed to meet their needs. We must create a new, separate Pediatric ER, with colorful decorations and child-friendly design, that will raise children’s spirits and reduce their anxiety. The dedicated facility will ensure that the child receives the immediate sophisticated care required, in an environment that is as child-friendly as possible. At Hadassah University Hospital Mount Scopus, a growing number of surgical procedures are carried out on an ambulatory (out-patient) basis. Currently there is a combined facility for Pediatric and Adult Ambulatory Day Care and five Ambulatory Operating Rooms. The facility provides day care treatments and surgical services for both children and adults. However the number of children requiring ambulatory surgical services is growing rapidly. We must create a dedicated Pediatric Ambulatory Day Care Facility and a dedicated Ambulatory Operating Room for children. We must improve the current surroundings, and create a patient-friendly facility that reflects the sophisticated level of medical care provided. We must renovate and expand the facilities. Medical equipment and furnishings must be purchased to augment existing items, or replace outdated ones. Walls will be decorated with cheerful, framed posters to create a bright, positive atmosphere for pediatric patients, many of whom often need to spend many hours at the facility on a regular basis. A colorful, child-friendly environment will help relax the young patient before and after the medical procedure, and will in turn help put the adult at ease. We must create a new dedicated Pediatric Emergency Room at Hadassah Hospital at Mount Scopus. We must create a new, modern, dedicated Pediatric Ambulatory Day Care Facility and a dedicated Ambulatory Operating Room for pediatric procedures at Hadassah Hospital at Mount Scopus. 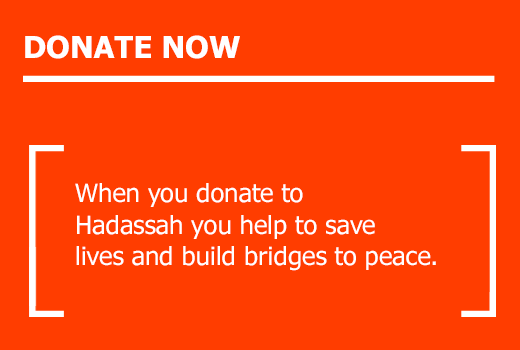 Your donation will help Hadassah provide child friendly facilities to treat children of all ethnic and religious backgrounds. You can help to build a bridge to peace. 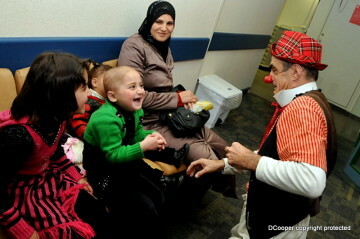 Throughout Hadassah, medical clowns ease the hospital experience for frightened children, while our pediatric healing gardens enhance the well-being of children with chronic diseases.